They’re involved in Algeria and Angola, Benin and Botswana, Burkina Faso and Burundi, Cameroon and the Cape Verde Islands. And that’s just the ABCs of the situation. Skip to the end of the alphabet and the story remains the same: Senegal and the Seychelles, Togo and Tunisia, Uganda and Zambia. From north to south, east to west, the Horn of Africa to the Sahel, the heart of the continent to the islands off its coasts, the US military is at work. Base construction, security cooperation engagements, training exercises, advisory deployments, special operations missions, and a growing logistics network, all undeniable evidence of expansion—except at US Africa Command. To hear AFRICOM tell it, US military involvement on the continent ranges from the miniscule to the microscopic. The command is adamant that it has only a single “military base” in all of Africa: Camp Lemonnier in Djibouti. The head of the command insists that the US military maintains a “small footprint” on the continent. AFRICOM’s chief spokesman has consistently minimized the scope of its operations and the number of facilities it maintains or shares with host nations, asserting that only “a small presence of personnel who conduct short-duration engagements” are operating from “several locations” on the continent at any given time. The proof is in the details—a seemingly ceaseless string of projects, operations, and engagements. Each mission, as AFRICOM insists, may be relatively limited and each footprint might be “small” on its own, but taken as a whole, US military operations are sweeping and expansive. Evidence of an American pivot to Africa is almost everywhere on the continent. Few, however, have paid much notice. If the proverbial picture is worth a thousand words, then what’s a map worth? Take, for instance, the one created by TomDispatch that documents US military outposts, construction, security cooperation, and deployments in Africa. It looks like a field of mushrooms after a monsoon. US Africa Command recognizes 54 countries on the continent, but refuses to say in which ones (or even in how many) it now conducts operations. An investigation by TomDispatch has found recent US military involvement with no fewer than 49 African nations. In some, the US maintains bases, even if under other names. In others, it trains local partners and proxies to battle militants ranging from Somalia’s al-Shabaab and Nigeria’s Boko Haram to members of Al Qaeda in the Islamic Maghreb. Elsewhere, it is building facilities for its allies or infrastructure for locals. Many African nations are home to multiple US military projects. Despite what AFRICOM officials say, a careful reading of internal briefings, contracts, and other official documents, as well as open source information, including the command’s own press releases and news items, reveals that military operations in Africa are already vast and will be expanding for the foreseeable future. 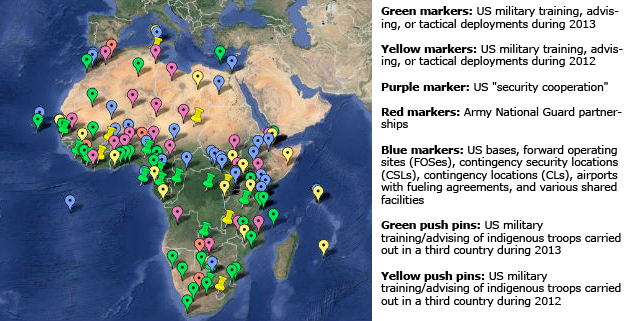 A briefing prepared last year by Captain Rick Cook, the chief of AFRICOM’s Engineering Division, tells a different story, making reference to forward operating sites or FOSes (long-term locations), cooperative security locations or CSLs (which troops periodically rotate in and out of), and contingency locations or CLs (which are used only during ongoing operations). A separate briefing prepared last year by Lieutenant Colonel David Knellinger references seven cooperative security locations across Africa whose whereabouts are classified. A third briefing, produced in July of 2012 by US Army Africa, identifies one of the CSL sites as Entebbe, Uganda, a location from which US contractors have flown secret surveillance missions using innocuous-looking, white Pilatus PC-12 turboprop airplanes, according to an investigation by theWashington Post. The 2012 US Army Africa briefing materials obtained by TomDispatch reference plans to build six new gates to the Entebbe compound, 11 new “containerized housing units,” new guard stations, new perimeter and security fencing, enhanced security lighting and new concrete access ramps, among other improvements. Satellite photos indicate that many, if not all, of these upgrades have, indeed, taken place. A 2009 image (above left) shows a bare-bones compound of dirt and grass tucked away on a Ugandan air base with just a few aircraft surrounding it. A satellite photo of the compound from earlier this year (above right) shows a strikingly more built-up camp surrounded by a swarm of helicopters and white airplanes. Initially, AFRICOM’s Benjamin Benson refused to comment on the construction or the number of aircraft, insisting that the command had no “public information” about it. Confronted with the 2013 satellite photo, Benson reviewed it and offered a reply that neither confirmed nor denied that the site was a US facility, but cautioned me about using “uncorroborated data.” (Benson failed to respond to my request to corroborate the data through a site visit.) “I have no way of knowing where the photo was taken and how it was modified,” he told me. “Assuming the location is Entebbe, as you suggest, I would again argue that the aircraft could belong to anyone…It would be irresponsible of me to speculate on the missions, roles, or ownership of these aircraft.” He went on to suggest, however, that the aircraft might belong to the United Nations Organization Stabilization Mission in the Democratic Republic of the Congo (MONUSCO) which does have a presence at the Entebbe air base. A request for comment from MONUSCO went unanswered before this article went to press. This buildup may only be the beginning for Entebbe CSL. Recent contracting documents examined byTomDispatch indicate that AFRICOM is considering an additional surge of air assets there—specifically hiring a private contractor to provide further “dedicated fixed-wing airlift services for movement of Department of Defense (DoD) personnel and cargo in the Central African Region.” This mercenary air force would keep as many as three planes in the air at the same time on any given day, logging a total of about 70 to 100 hours per week. If the military goes ahead with these plans, the aircraft would ferry troops, weapons, and other materiel within Uganda and to the Central African Republic, the Democratic Republic of Congo, and South Sudan. Another key, if little noticed, US outpost in Africa is located in Ouagadougou, the capital of Burkina Faso. An airbase there serves as the home of a Joint Special Operations Air Detachment, as well as the Trans-Sahara Short Take-Off and Landing Airlift Support initiative. According to military documents, that “initiative” supports “high-risk activities” carried out by elite forces from Joint Special Operations Task Force-Trans Sahara. Lieutenant Colonel Scott Rawlinson, a spokesman for Special Operations Command Africa, told me that it provides “emergency casualty evacuation support to small team engagements with partner nations throughout the Sahel,” although official documents note that such actions have historically accounted for only 10% of its monthly flight hours. While Rawlinson demurred from discussing the scope of the program, citing operational security concerns, military documents again indicate that, whatever its goals, it is expanding rapidly. Between March and December 2012, for example, the initiative flew 233 sorties. In the first three months of this year, it carried out 193. Drone bases are also expanding. In February, the US announced the establishment of a new drone facility in Niger. Later in the spring, AFRICOM spokesman Benjamin Benson confirmed to TomDispatch that US air operations conducted from Base Aerienne 101 at Diori Hamani International Airport in Niamey, Niger’s capital, were providing “support for intelligence collection with French forces conducting operations in Mali and with other partners in the region.” More recently, the New York Times noted that what began as the deployment of one Predator drone to Niger had expanded to encompass daily flights by one of two larger, more advanced Reaper remotely piloted aircraft, supported by 120 Air Force personnel. Additionally, the US has flown drones out of the Seychelles Islands and Ethiopia’s Arba Minch Airport. An AFRICOM briefing earlier this year suggested, however, that the base is destined to be more than a backwater post. It called attention to improvements in water and power infrastructure and an extension of the runway at the airfield, as well as greater “surge capacity” for bringing in forces in the future. A second briefing, prepared by the Navy and obtained by TomDispatch, details nine key infrastructure upgrades that are on the drawing board, underway, or completed. AFRICOM’s Benson tells TomDispatch that the US military also makes use of six buildings located on Kenyan military bases at the airport and seaport of Mombasa. In addition, he verified that it has used Léopold Sédar Senghor International Airport in Senegal for refueling stops as well as the “transportation of teams participating in security cooperation activities” such as training missions. He confirmed a similar deal for the use of Addis Ababa Bole International Airport in Ethiopia. While Benson refused additional comment, official documents indicate that the US has similar agreements for the use of Nsimalen Airport and Douala International Airport in Cameroon, Amílcar Cabral International Airport and Praia International Airport in Cape Verde, N’Djamena International Airport in Chad, Cairo International Airport in Egypt, Jomo Kenyatta International Airport and Moi International Airport in Kenya, Kotoka International Airport in Ghana, ‎ Marrakech-Menara Airport in Morocco, Nnamdi Azikiwe International Airport in Nigeria, Seychelles International Airport in the Seychelles, Sir Seretse Khama International Airport in Botswana, Bamako-Senou International Airport in Mali, and Tunis-Carthage International Airport in Tunisia. ‎All told, according to Sam Cooks, a liaison officer with the Defense Logistics Agency, the US military now has 29 agreements to use international airports in Africa as refueling centers. In addition, US Africa Command has built a sophisticated logistics system, officially known as the AFRICOM Surface Distribution Network, but colloquially referred to as the “new spice route.” It connects posts in Manda Bay, Garissa, and Mombasa in Kenya, Kampala and Entebbe in Uganda, Dire Dawa in Ethiopia, as well as crucial port facilities used by the Navy’s CTF-53 (“Commander, Task Force, Five Three”) in Djibouti, which are collectively referred to as “the port of Djibouti” by the military. Other key ports on the continent, according to Lieutenant Colonel Wade Lawrence of US Transportation Command, include Ghana’s Tema and Senegal’s Dakar. The US maintains 10 marine gas and oil bunker locations in eight African nations, according to the Defense Logistics Agency. AFRICOM’s Benjamin Benson refuses to name the countries, but recent military contracting documents list key fuel bunker locations in Douala, Cameroon; Mindelo, Cape Verde; Abidjan, Cote D’Ivoire; Port Gentil, Gabon; Sekondi, Ghana; Mombasa, Kenya; Port Luis, Mauritius; Walvis Bay, Namibia; Lagos, Nigeria; Port Victoria, Seychelles; Durban, South Africa; and Dar Es Salaam, Tanzania. The US also continues to maintain a long-time Naval Medical Research Unit, known as NAMRU-3, in Cairo, Egypt. Another little-noticed medical investigation component, the US Army Research Unit-Kenya, operates from facilities in Kisumu and Kericho. When considering the scope and rapid expansion of US military activities in Africa, it’s important to keep in mind that certain key “African” bases are actually located off the continent. Keeping a semblance of a “light footprint” there, AFRICOM’s headquarters is located at Kelley Barracks in Stuttgart-Moehringen, Germany. In June, Süddeutsche Zeitung reported that the base in Stuttgart and the US Air Force’s Air Operations Center in Ramstein were both integral to drone operations in Africa. Key logistics support hubs for AFRICOM are located in Rota, Spain; Aruba in the Lesser Antilles; and Souda Bay, Greece, as well as at Ramstein. The command also maintains a forward operating site on Britain’s Ascension Island, located about 1,000 miles off the coast of Africa in the South Atlantic, but refused requests for further information about its role in operations. Another important logistics facility is located in Sigonella on the island of Sicily. Italy, it turns out, is an especially crucial component of US operations in Africa. Special-Purpose Marine Air-Ground Task Force Africa, which provides teams of Marines and sailors for “small-footprint theater security cooperation engagements” across the continent, is based at Naval Air Station Sigonella. It has, according to AFRICOM’s Benjamin Benson, recently deployed personnel to Botswana, Liberia, Djibouti, Burundi, Uganda, Tanzania, Kenya, Tunisia, and Senegal. In the future, US Army Africa will be based at Caserma Del Din in northern Italy, adjacent to the recentlycompleted home of the 173rd Airborne Brigade Combat Team. A 2012 US Army Africa briefing indicates that construction projects at the Caserma Del Din base will continue through 2018. The reported price-tag for the entire complex: $310 million. While that sum is sizeable, it’s surpassed by spending on the lone official US base on the African continent, Camp Lemonnier in Djibouti. That former French Foreign Legion post has been on a decade-long growth spurt. In 2002, the US dispatched personnel to Africa as part of Combined Joint Task Force-Horn of Africa (CJTF-HOA). The next year, CJTF-HOA took up residence at Camp Lemonnier, where it resides to this day. In 2005, the US struck a five-year land-use agreement with the Djiboutian government and exercised the first of two five-year renewal options in late 2010. In 2006, the US signed a separate agreement to expand the camp’s boundaries to 500 acres. According to AFRICOM’s Benson, between 2009 and 2012, $390 million was spent on construction at Camp Lemonnier. In recent years, the outpost was transformed by the addition of an electric power plant, enhanced water storage and treatment facilities, a dining hall, more facilities for Special Operations Command, and the expansion of aircraft taxiways and parking aprons. A briefing prepared earlier this year by the Naval Facilities Engineering Command lists a plethora of projects currently underway or poised to begin, including an aircraft maintenance hangar, a telecommunications facility, a fire station, additional security fencing, an ammunition supply facility, interior paved roads, a general purpose warehouse, maintenance shelters for aircraft, an aircraft logistics apron, taxiway enhancements, expeditionary lodging, a combat aircraft loading apron, and a taxiway extension on the east side of the airfield. According to a 2012 briefing by Lieutenant Colonel David Knellinger, the Special Operations Compound will eventually include at least 18 new facilities, including a two-story joint operations center, a two-story tactical operations center, two five-story barracks, a large motor pool facility, a supply warehouse, and an aircraft hangar with an adjacent air operations center. A document produced earlier this year by Lieutenant Troy Gilbert, an infrastructure planner with AFRICOM’s engineer division, lists almost $400 million in “emergency” military construction at Camp Lemonnier, including work on the special operations compound and more than $150 million for a new combat aircraft loading area. Navy documents, for their part, estimate that construction at Camp Lemonnier will continue at $70 million to $100 million annually, with future projects to include a $20 million wastewater treatment plant, a $40 million medical and dental center, and more than $150 million in troop housing. In addition, the US military has been supporting construction all over Africa for its allies. A report by Hugh Denny of the Army Corps of Engineers issued earlier this year references 79 such projects in 33 countries between 2011 and 2013, including Benin, Botswana, Burkina Faso, Cameroon, Cape Verde, Chad, Cote D’Ivoire, Djibouti, Ethiopia, Ghana, Guinea, Kenya, Lesotho, Liberia, Malawi, Mali, Mauritania, Mauritius, Mozambique, Niger, Nigeria, Rwanda, Senegal, Sierra Leone, Swaziland, Tanzania, Tunisia, The Gambia, Togo, Uganda, and Zambia. The reported price tag: $48 million. Senegal has, for example, received a $1.2 million “peacekeeping operations training center” under the auspices of the US Africa Contingency Operations Training and Assistance (ACOTA) program. ACOTA has also supported training center projects in Benin, Burkina Faso, Burundi, Djibouti, Ethiopia, Kenya, Malawi, Nigeria, Niger, Rwanda, Sierra Leone, South Africa, Tanzania, Togo, and Uganda. The US is planning to finance the construction of barracks and other facilities for Ghana’s armed forces. AFRICOM’s Benson also confirmed to TomDispatch that the Army Corps of Engineers has plans to “equip and refurbish five military border security posts in Djibouti along the Somalia/Somaliland border.” In Kenya, US Special Operations Forces have “played a crucial role in infrastructure investments for the Kenyan Special Operations Regiment and especially in the establishment of the Kenyan Ranger school,” according to Lieutenant Colonel Guillaume Beaurpere of the 3rd Battalion, 10th Special Forces Group. AFRICOM’s “humanitarian assistance” program is also expansive. A 2013 Navy briefing lists $7.1 million in humanitarian construction projects—like schools, orphanages, and medical facilities—in 19 countries from Comoros and Guinea-Bissau to Rwanda. Hugh Denny’s report also lists nine Army Corps of Engineers “security assistance” efforts, valued at more than $12 million, carried out during 2012 and 2013, as well as 15 additional “security cooperation” projects worth more than $22 million in countries across Africa. In addition to creating or maintaining bases and engaging in military construction across the continent, the US is involved in near constant training and advisory missions. According to AFRICOM’s Colonel Tom Davis, the command is slated to carry out 14 major bilateral and multilateral exercises by the end of this year. These include Saharan Express 2013, which brought together forces from Cape Verde, Cote d’Ivoire, The Gambia, Liberia, Mauritania, Morocco, Senegal, and Sierra Leone, among other nations, for maritime security training; Obangame Express 2013, a counter-piracy exercise involving the armed forces of many nations, including Benin, Cameroon, Cote d’Ivoire, Equatorial Guinea, Gabon, Nigeria, Republic of Congo, São Tomé and Príncipe, and Togo; and Africa Endeavor 2013, in which the militaries of Djibouti, Burundi, Cote d’Ivoire, Zambia, and 34 other African nations took part. And that’s just the tip of the iceberg. As Davis told TomDispatch, “We also conduct some type of military training or military-to-military engagement or activity with nearly every country on the African continent.” A cursory look at just some of US missions this spring drives home the true extent of the growing US engagement in Africa. In January, for instance, the US Air Force began transporting French troops to Mali to counter Islamist forces there. At a facility in Nairobi, Kenya, AFRICOM provided military intelligence training to junior officers from Kenya, Uganda, Burundi, Ethiopia, Tanzania, and South Sudan. In January and February, Special Operations Forces personnel conducted a joint exercise code-named Silent Warrior with Cameroonian soldiers. February saw South African troops travel all the way to Chiang Mai, Thailand, to take part in Cobra Gold 2013, a multinational training exercise cosponsored by the US military. In March, Navy personnel worked with members of Cape Verde’s armed forces, while Kentucky National Guard troops spent a week advising soldiers from the Comoros Islands. That same month, members of Special-Purpose Marine Air-Ground Task Force Africa deployed to the Singo Peace Support Training Center in Uganda to work with Ugandan soldiers prior to their assignment to the African Union Mission in Somalia. Over the course of the spring, members of the task force would also mentor local troops in Burundi, Cameroon, Ghana, Burkina Faso, the Seychelles, Mozambique, Tanzania, and Liberia. In April, members of the task force also began training Senegalese commandos at Bel-Air military base in Dakar, while Navy personnel deployed to Mozambique to school civilians in demining techniques. Meanwhile, Marines traveled to Morocco to conduct a training exercise code-named African Lion 13 with that country’s military. In May, Army troops were sent to Lomé, Togo, to work with members of the Togolese Defense Force, as well as to Senga Bay, Malawi, to instruct soldiers there. That same month, Navy personnel conducted a joint exercise in the Mediterranean Sea with their Egyptian counterparts. In June, personnel from the Kentucky National Guard deployed to Djibouti to advise members of that country’s military on border security methods, while Seabees teamed up with the Tanzanian People’s Defense Force to build maritime security infrastructure. That same month, the Air Force airlifted Liberian troops to Bamako, Mali, to conduct a six-month peacekeeping operation. Counting countries in which it has bases or outposts or has done construction, and those with which it has conducted military exercises, advisory assignments, security cooperation, or training missions, the US military, according to TomDispatch‘s analysis, is involved with more than 90% of Africa’s 54 nations. While AFRICOM commander David Rodriguez maintains that the US has only a “small footprint” on the continent, following those small footprints across the continent can be a breathtaking task. Exploitation and “persistent engagement” are exactly what critics of US military involvement in Africa have long feared, while blowback and the unforeseen consequences of US military action on the continent have already contributed to catastrophic destabilization. My own requests to report on US operations on the continent were, in fact, rejected in short order. “We will not make an exception in this case,” Benson wrote in a recent email and followed up by emphasizing that US forces are deployed in Africa only “on a limited and temporary basis.” TomDispatch‘s own analysis—and a mere glance at the map of recent missions—indicates that there are, in fact, very few limits on where the US military operates in Africa. While Washington talks openly about rebalancing its military assets to Asia, a pivot to Africa is quietly and unmistakably underway. With the ever-present possibility of blowback from shadowy operations on the continent, the odds are that the results of that pivot will become increasingly evident, whether or not Americans recognize them as such. Behind closed doors, the military says: “Africa is the battlefield of tomorrow, today.” It remains to be seen just when they’ll say the same to the American people. Nick Turse is the managing editor of TomDispatch.com and a fellow at The Nation Institute. An award-winning journalist, his work has appeared in the Los Angeles Times and The Nation, on the BBC, andregularly at TomDispatch. He is the author most recently of the New York Times bestseller Kill Anything that Moves: The Real American War in Vietnam. You can catch his conversation with Bill Moyers about that book by clicking here. His website is NickTurse.com. To stay on top of important articles like these, sign up to receive the latest updates from TomDispatch.com here. Warming up for Syria, while the façade of diplomacy is plastered all over the mainstream media. No Black man, having true consciousness of himself, and his history, would ever aspire to be president of the United States- the present vicar of global white supremacy! I wish I could fully contextualize the present state of this seeming global pathology in macrocosm. But one thing is evident. The leaf of the tree can never destroy the root without destroying itself. And leaves come, and go, while the root remains.This is no different than the fact that the lights of phenomenal expression come and goes. Even white light cannot escape the gravitational vortex of a black hole. And no matter how much this temporal culture is determined to demonize the darkness by language and deeds, all that exist, and ever will be, come from the darkness of Man’s unconsciousness- a place where the death of peoples as utility has no meaning.